The new Lamborghini Aventador S is characterized by new aerodynamic design, redeveloped suspension, increased power and new driving dynamics. The 'S' is the suffix of previous enhanced Lamborghini models and defines a new benchmark for the V12 Lamborghini. "This is the next generation Aventador as well as the expression of new technological and performance milestones in super sports car development," says Automobili Lamborghini Chairman and Chief Executive Officer Stefano Domenicali. "The Aventador S is visionary design, cutting-edge technology and driving dynamics in pure harmony, and elevates the concept of super sports cars to a new level." The design of the new Aventador S clearly indicates the new Aventador generation. The Aventador S features a number of exterior developments, particularly in front and rear, while its profile remains clearly an Aventador. Every modified component is redesigned for a purpose, achieving maximum aerodynamic efficiency while accenting the Aventador's complex, muscular dynamism. Furthermore, Lamborghini Centro Stile has intelligently integrated certain elements of past icons, such as the lines of rear wheel arches reminiscent of the original Countach. The active rear wing is movable in three positions depending on speed and drive select mode, and optimizes the car's improved overall balance, working with vortex generators created in the front and rear of the chassis' underside that maximize air flow as well as assist in brake cooling. The Aventador S design results in significantly enhanced aerodynamic performance. Front downforce has been improved by more than 130% over the previous Aventador coupé. When the wing is in its optimum position the overall efficiency at high downforce is improved by over 50%, and in low drag by more than 400% compared to the previous model. The Aventador S chassis retains the Aventador's unique and extremely rigid lightweight carbon fiber monocoque with attached aluminum frames resulting in a dry weight of just 1,575 kg. The Aventador S is redeveloped around a 'total control concept' to provide a superior drive, ride and performance; every aspect of the car's suspension and electronic control systems has been advanced, with the goal of particularly enhanced control and driving emotion. Enhanced lateral control comes from new four-wheel steering, adopted for the first time on a series production Lamborghini. The system provides improved agility at low and medium speeds and more stability at high speed. On the front axle it is combined with Lamborghini Dynamic Steering (LDS), tuned for a more natural and responsive feel with a sharper turn-in. It is specially adapted to integrate with the active Lamborghini Rear-wheel Steering (LRS) on the rear axle: two separate actuators react in five milliseconds to driver's steering movements, allowing a real-time angle and cornering stiffness adjustment. At low speeds, front wheels face in opposite direction to the steering angle, thereby virtually reducing the wheelbase. With less steering wheel angle required, the Aventador S is more agile with a reduced turning radius, ensuring higher performance in curves and making it easy to manoeuvrer in town and at low speeds. Conversely at higher speeds both front and rear wheels share the same steering angle, thus virtually extending the wheelbase, providing increased stability and optimizing the responsiveness of the car. Vertical control comes from Lamborghini's updated pushrod and Lamborghini Magneto-rheological Suspension (LMS), with revised kinematics adapted to the new four-wheel steering. New suspension geometry, optimized for Lamborghini Rear-wheel Steering, includes upper and lower arm and wheel carrier to reduce caster and load on the system. A new real-time variable damping system optimizes wheel and body control, and balance and ground stiffness is maximized. New rear springs also enhance the car's balance. Longitudinal control is achieved via an improved ESC strategy with faster and more precise control of traction control and vehicle dynamics, depending on the driving mode selected. Extensively tested on surfaces such as snow and ice, the Aventador S has improved adhesion detection to maximize grip in all conditions and enhance its handling capabilities. 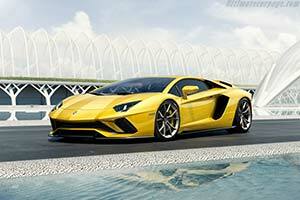 The Aventador S permanent four-wheel drive has been calibrated for the stabilizing effect of the new Lamborghini Rear-wheel Steering, allowing more torque to the rear axle: when powering off the throttle, less torque is shifted to the front axle to allow over- steer behavior and a sporty, but safe drive. Lamborghini engineers have integrated the smart Lamborghini Dinamica Veicolo Attiva (LDVA) control unit to manage these systems in the car. LDVA is the new brain of the car, which receives real time and precise information on body motion via input from all sensors of the car. It instantly defines the best set-up of all active systems in order to guarantee the best vehicle dynamics in each and every condition.